Plus Martin Short goes for a Cat In The Hat hat trick, and Dan and Eugene Levy face off again. While the U.S. continues to monopolize the world's award show-related attention (especially this year thanks to the Oscars being such a hot mess), let us please take some time today to remind ourselves we have awards shows too! Like the Juno Awards, which announced their Shawn Mendes-led nominations last week, and will be hosted by Sarah McLachlan. Or the Canadian Screen Awards, which gave us nominations in like 10,000 categories this morning. And since they're a lot to digest and ain't nobody got time to scroll through all the categories (except me, apparently), here's the 411. Let's skip the Canadian humility and get out a full-on brag first: the team here at CBC Arts had a lot celebrate this morning. We were nominated for nine Canadian Screen Awards in total, including best talk or entertainment program or series (The Filmmakers), best web program or series (The Move and The Artists: The Pioneers Behind The Pixels), best biography or arts documentary program or series (Interrupt This Program) and best directing nods for both The Move (yay Lucius Dechausay!) and In The Making(yay Chelsea McMullan!). Three of 5 nominees for film directing were women. 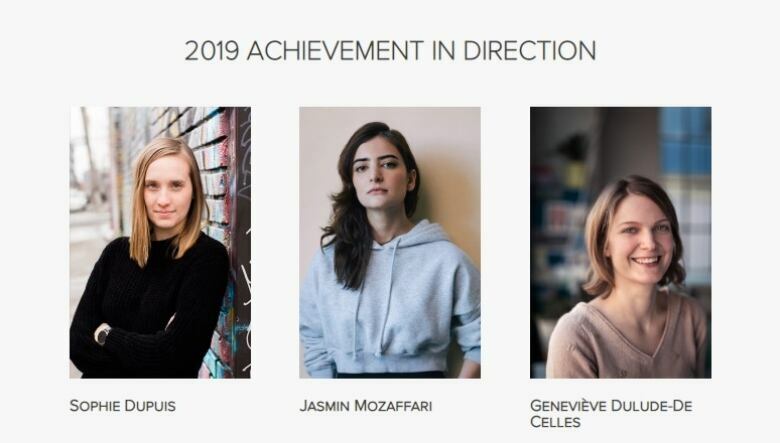 While Oscars have only nominated three women in their best directing category in the past 25 years, the Canadian Screen Awards nominated three this year alone in their equivalent film category: Sophie Dupuis (Family First), Jasmin Mozaffari (Firecrackers) and Geneviève Dulude-De Celles (A Colony). And that extended onto the TV side as well. Beyond the aforementioned In The Making filmmaker Chelsea McMullan, the 15 female nominees across 11 categories included Catherine Reitman (Workin Moms), Tracy Deer (Mohawk Girls), Norma Bailey (Mary Kills People), Helen Shaver (Anne With an E), Christine Nielsen (Jumbo), Cynthia Banks (The Caregivers' Club), Wendy Rowland (14 & Muslim), Leora Eisen (Into The Fire) and Elisa Paloschi (Driving with Selvi) were among the 15 female nominees across 11 categories. When it comes to directing reality/competition shows, Canada is apparently a two-man show. 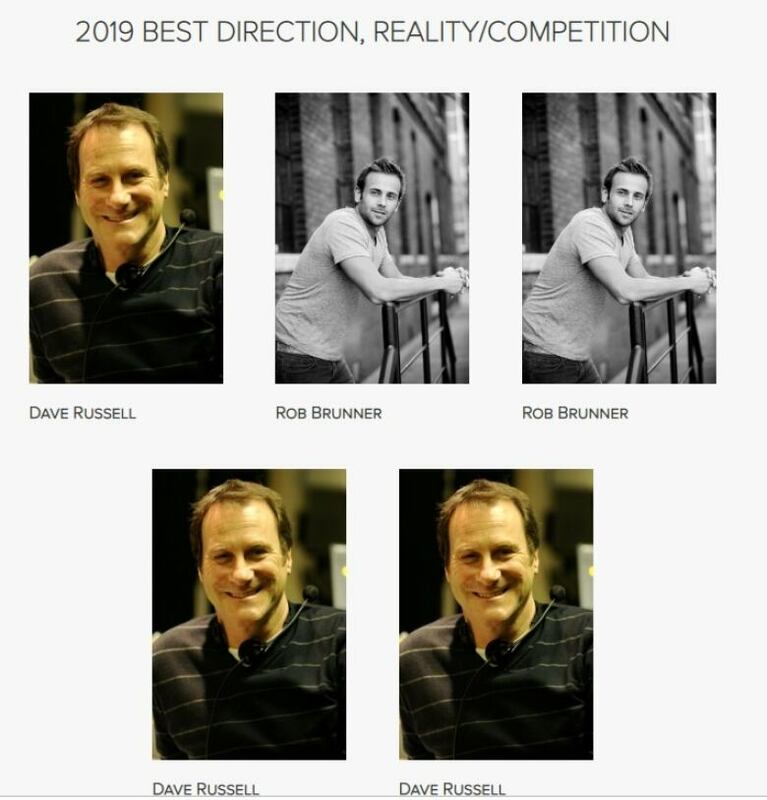 The nominees for best direction, reality/competition. Schitt's Creek's Eugene and Dan Levy are both nominated for best actor in a comedy series for the fourth straight year, and the man that beat them both the last two years, Kim's Convenience star Paul Sun-Hyung Lee, was not nominated this year due to eligibility. Will Dan finally beat his dad, or does Eugene rise again? Or...do they split the vote and let Jason Priestley finally get rewarded for his comedic talents? From father and son to...holy ghosts! One of the nominations that made me do the most double takes today was Knock Knock Ghost's inclusion alongside the Canadian versions of MasterChef, The Amazing Race, Big Brother and Smartest Person Junior for best reality/competition series. What is Knock Knock Ghost, you ask? 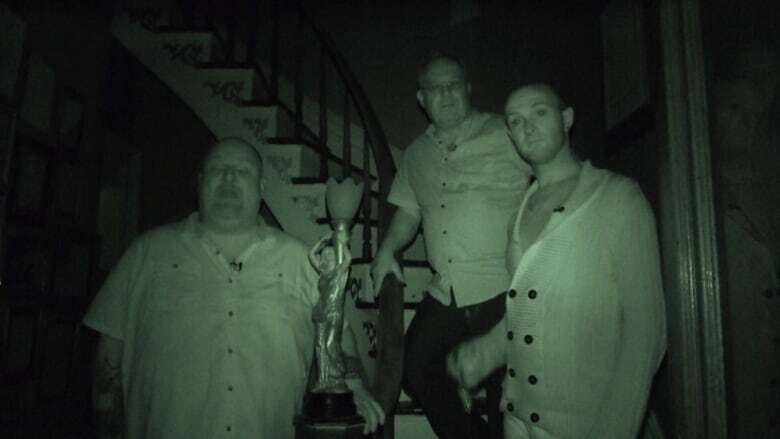 Oh, just a show about a psychic medium and a comedian travelling around visiting Canada's most haunted locations because "no place is too haunted for a laugh." And that ghost show is not alone. In the web program or series category, Ghost BFF is nominated for its depiction of two women — one dead and one alive — who travel across space and time, while paranormal film Our House has three nominations in the film categories. Plus, Frankie Drake Mysteries got a nod for best direction in a drama series for, of course, their episode "Ghosts." Sarah Gadon vs. the children. 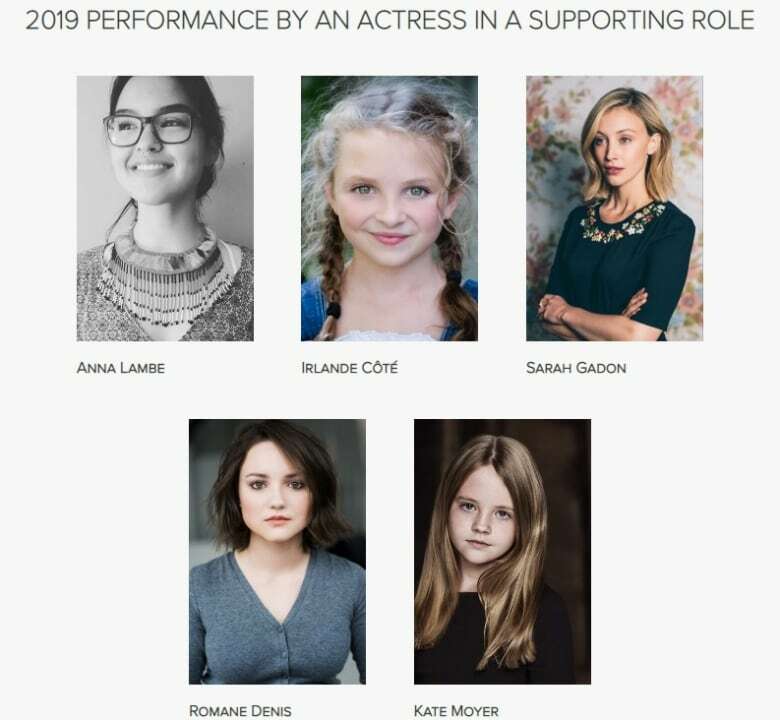 Move over, Jacob Tremblay — there are so many children and teenagers nominated in the film acting categories this year: Jacob Whiteduck-Lavoie, Émilie Bierre, Valeria Henríquez, Anna Lambe, Carla Tyrcotte, Rose-Marie Perreault, Irlande Côté, Romaine Denis and Kate Moyer make up 8/20 nominees. That's 40% kids and teens, and just 5% Sarah Gadon. While it's not of the Room and Brooklyn capacities of years past, there are two films who now have both Academy Award and Canadian Screen Award nominations: best animated short nominee Animal Behaviour and best live action short Fauve. 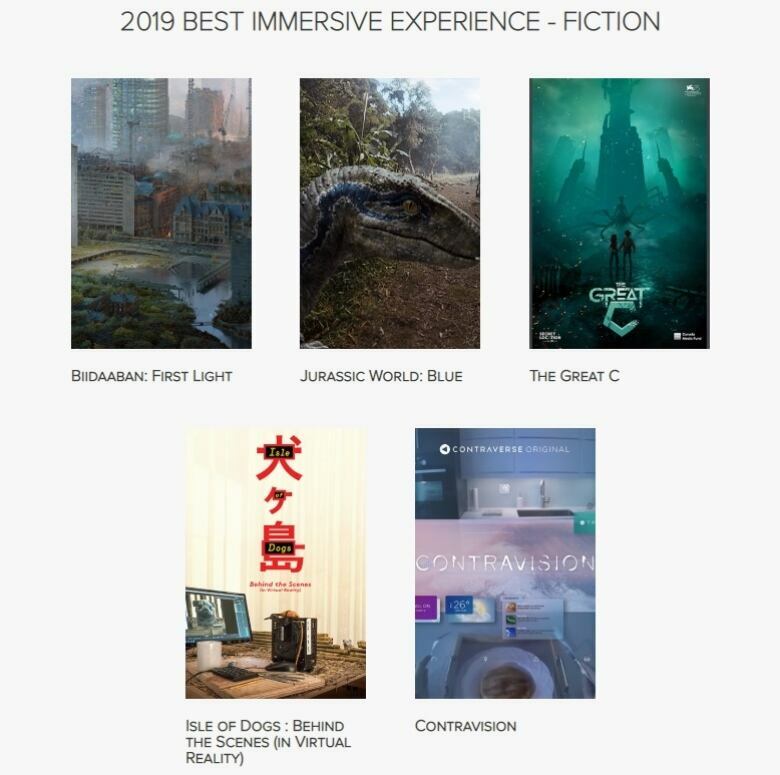 The nominees for best immersive experience. One step closer to whatever the Canadian equivalent of the EGOT is, Jann Arden has been nominated for a CSA for her supporting role in Workin' Moms. "Good mother," indeed (sorry). Martin Short was won the category of best performance, animation for two straight years for playing the cat in The Cat in the Hat and he's nominated again. And honestly, is there a more Canadian award show sentence than "Martin Short performs Canadian Screen Award hat trick"? The Canadian Screen Awards gala airs Sunday, March 31 at 8pm ET on CBC.